An underwater research facility is attacked by a gigantic prehistoric Megaladon shark. While superheroes continue to dominate the modern box office, this summer has seen a resurgence in the sort of old school wannabe blockbusters that dominated Hollywood in the 1990s. Movies like The Hurricane Heist, Skyscraper and now The Meg take elements of the blockbuster's past - disaster movies, Die Hard, man versus nature - and stir up a contemporary concoction. 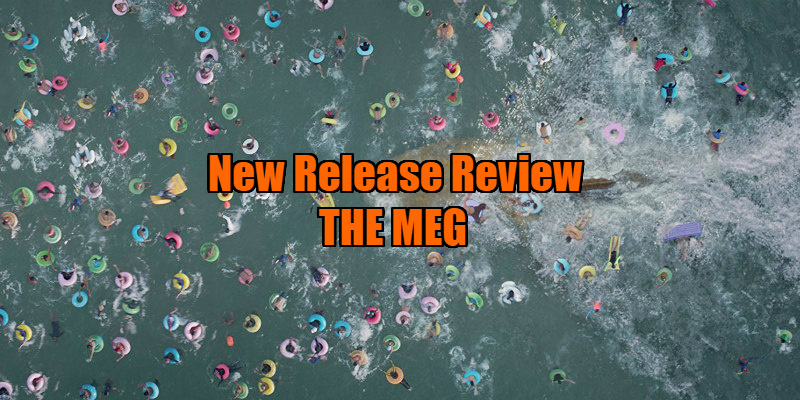 You can largely thank the reticence of the Asian cinemagoing public to indulge in superheroes and Star Wars for this revival of simpler thrills, and with its international cast and Chinese funding, The Meg knows exactly where it's going to make most of its profit from. 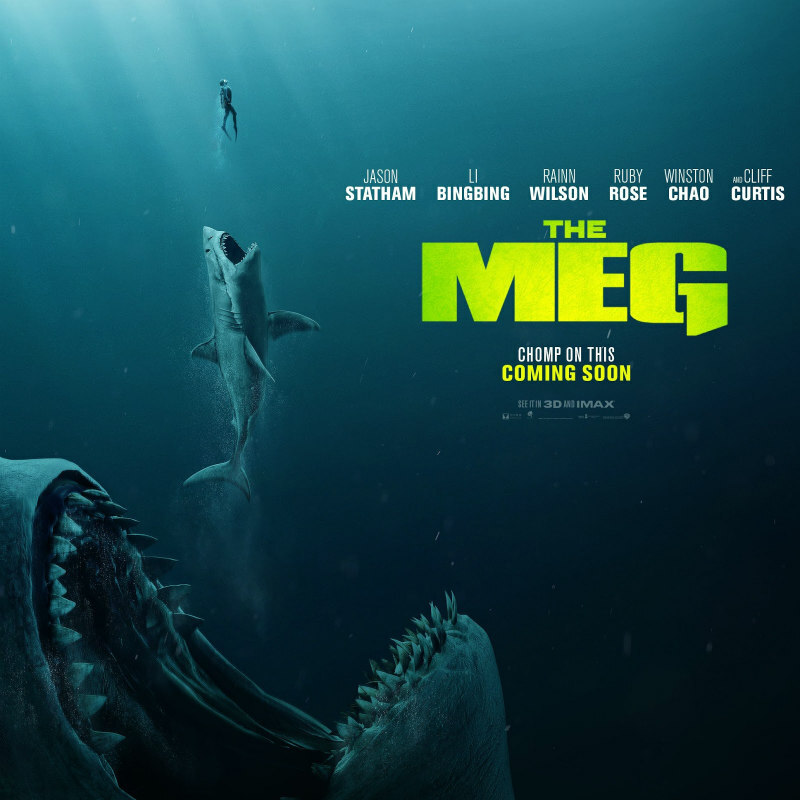 Falling somewhere between the seriousness of Jaws and the knowing nonsense of Sharknado, The Meg's main selling point is the draw of seeing larger than life action man Jason Statham come up against an absolute unit of a foe, a battleship sized prehistoric Megalodon shark. As is de rigueur with the heroes of such fare, Statham's retired rescue diver Jonas Taylor is tortured by his past, having once failed to save a small group of divers from a shark attack as a result of saving a larger group. Simple maths tell you Taylor did the right thing, but he's quit the rescue diving life and now spends his days passed out drunk in a Thai bar. That's until old friend Mac (Cliff Curtis) convinces Taylor to 'do it for us one more time' and come to the aid of the crew of a submersible which has become trapped on the ocean floor. Seeing a chance at redemption, Taylor agrees, but during his rescue attempt he realises what exactly caused the vessel to become trapped - the titular Megalodon. The crew of the underwater research facility involved realise they may all be next on the menu for the hungry shark. The Meg offers up the usual array of stereotypical fish fodder. There's chief scientist Zhang (Winston Chao); his daughter and love interest for the Stath, Suyin (Li Bingbing); her precocious daughter Meiying (Shuya Sophia Cai); Morris (Rainn Wilson), the facility's douchebag billionaire funder; Jaxx (Ruby Rose), some sort of computer whiz; DJ (Page Kennedy), the obligatory cowardly black guy, whose mugging isn't far off that of controversial '30s African-American comics Mantan Moreland and Willie Best; and various undefined redshirts. 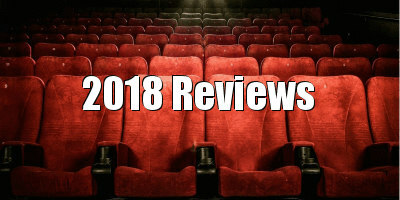 With the exception of Morris and the irritating and racially problematic DJ, all the assembled characters are likeable, and Statham and Bingbing have a cute 'will they, won't they' dynamic that reminds you how scared Hollywood has recently become in portraying flirtatious relationships between men and women, particularly in an inter-racial context. Some of the best lines go to Cai's gifted kid Meiying, who appears to be the smartest cookie on a station filled with scientists. Stath versus shark is all well and good, but The Meg fails to exploit either of its top-billed beasts. Perhaps Statham was chosen for the role because of his past as an Olympic diver, but having him spend most of the movie seated behind the controls of various underwater vessels is a waste of his athletic talents. The ocean liner sized elephant in the room is The Meg's lack of gore. Let's not fib ourselves, if you're buying a ticket for a movie with this premise you're hoping to see a variety of characters get chomped and chewed in graphic detail. Very few people actually get eaten in The Meg, which is fine - Spielberg killed less than a handful in Jaws after all, but he made you feel every death and his movie pushed its PG rating to the limit. Whenever the eponymous Meg claims a victim, the screen is obscured by a giant splash of water to ensure we aren't treated to any gruesome details. As a result, the heavily trailer teased set-piece involving a Chinese beach packed with potential shark bait swimmers turns out to be a damp squib when it could have rivalled the outrageously over the top central massacre of Alexandre Aja's under-appreciated Piranha 3D. It's akin to how the Japanese put black bars over the genitalia of their pornstars - do they really think anyone is watching this stuff for the storyline? The Meg is at its best when it acknowledges how silly it really is and plays up to the clichés of the genre. It boasts a handful of gags that made me laugh out loud and a final irresistible Dad joke coda tells you everyone involved has their tongues planted firmly in their cheeks. As milque toast as the filmmaking here is, I'll take this over mopey men in tights every day.